Birchbox is a subscription service for men or women that delivers monthly fashion and lifestyle products at the price of $20 each. The boxes contain about five samples that are matched to your preferences. These products are available full-sized in the Birchbox online store. The mission of Birchbox founders Katia Beauchamp and Hayley Barna is to allow women and men to sample quality fashion and lifestyle products without having to purchase them full-sized. Also, they wanted to narrow down the field by picking the best products based upon the customer’s needs and preferences. The company opened in 2010, offering products for women only. Birchbox for men was launched in 2012, and has been active ever since.The basic premise sounded solid, so I thought I would give it a shot. $20 per month, for three or four sample sized products and one full-sized lifestyle item, seemed more than reasonable. After filling out my shipping and payment information (one thing about the monthly subscription service space…You’ll always give personal info before filling out any preference questionnaires or learning anything else about what you might buy), and actually purchasing my first box, I was prompted to complete my profile information. I informed Birchbox of my skin tones, facial hair grooming habits, hair style and grooming concerns, basic clothing sizes, and what I was most excited to try out (beard supplies, bath and body, gadgets, etc.). I’m not sure if it is my computer, but the Birchbox website was a little clunky and difficult to scroll through. Other websites were working just fine at the same time, so I think it is an issue they might have to iron out or risk losing customers with minimal patience. Birchbox for men will allow me to get the most out of my summer. Sunshine and all!The lifestyle item I was given was some cool socks, ($24.99 retail). They were soft, easy to pack, and advertised as having “soft cashmere feel” which I really liked. Kiehl’s White Eagle Ultimate Brushless All Skin Types Shave Cream was one of the sample-sized grooming products I received. It boasts being “spiked with menthol and camphor,” a verb choice definitely targeted at men. While I do have a beard, I still shave closely under the chin line and above the cheek line. The product gave me a comfortable, close shave, but many other products have done the same. Good stuff, but didn’t blow me away. The next item was Parlor Moisturizing Sea Salt Spray for hair. “Beach hair is no longer reserved for long weekends,” or so the product literature claims. Everybody loves that salty volume and control our hair gets from the ocean. This product does a pretty darn good job of recreating it. I don’t think I would use it in a formal setting, but heading out for the night, or maybe at a weekend picnic, I would definitely give my hair that tousled look. I’m no spring chicken, so my skin is starting to show its age. The final two products I received are designed to combat that. Supergoop! SPF 30 Anti-Aging City Sunscreen Serum is lightweight (in a different way than the duffle bag is lightweight). In addition to sun protection, Supergoop! also provides moisture in the form of Vitamins E and B5. I liked the product, and I would use it again. It didn’t muck up my beard, as the name of the product implies that it might. The final product was Under Eye Complex by Baxter of California. The products states that it was “created specifically for men” and contains caffeine, antioxidant vitamins and seaweed extract. I tried it…Um, yeah, I think it made the skin below my eyes look better. I think. All in all, I’m impressed with Birchbox Man. For only $20 a month, you get a cool life style item, as well as a handful of high-quality grooming products to try. I will stick with my subscription, at least until I find all the products I would like to use. 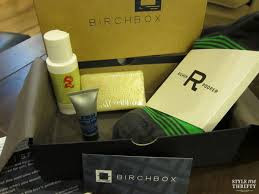 For those men who are looking for something fun and a little different I suggest checking them out.... You should find plenty of worthwhile trinkets in your monthly box and www.birchbox.com is defiantly worth a test spin.